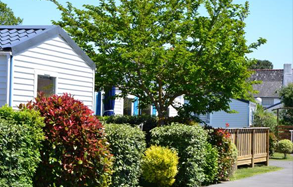 The Le Men Du campsite welcomes you in a calm, relaxing and green environnement. Open from the 1rst of April to the 1rst of September, the campsite is beautifully located,steps aways from Carnac’s delicate sand. and is a ideal starting point to visit the megaliths or to enjoy seaside activities. Wether you’re staying in a tent, a caravan or a camper, you’ll be able to enjoy a green and spacious delimited pitch. For more comfort, you’ll be able to choose between an array of modern mobil-homes. The reception desk is open daily from 09:00 to 12:30 and from 16:00 to 19:00.